Something from my bar whenever I feel like it episode CXIVsteemCreated with Sketch. Been a busy day so doing a quick episode today. 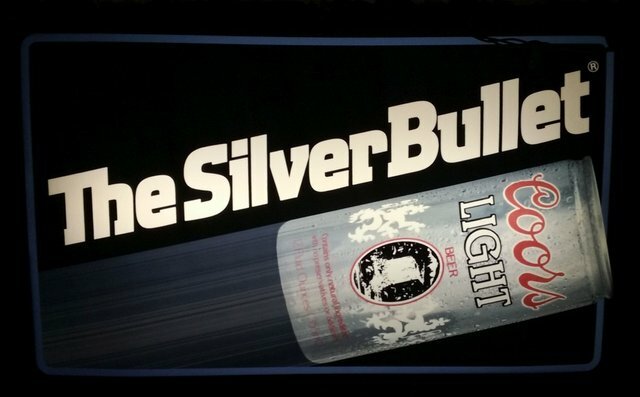 This is a standard Coors Light The Silver Bullet bar light. First bar light I ever had. My Dad won this in a golf tournament back when I was in high school. Was on the wall in my bedroom for years and move it to the bar when I moved in. It actually fell apart about a month ago. The plastic holes where the screws go in to hold it to the wall broke. Cheap plastic + weight of light over the years not a good combo. Tube of epoxy and some plastic packing ends from Christmas tree pipes I had laying around fixed that problem. That part isn't ever breaking again. I love bar signs. I started collecting them years ago, but it got too expensive, so I stopped.